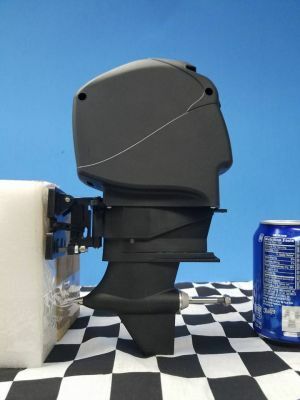 1/5 Scale X Cat Outboard made by MHZ in Europe. 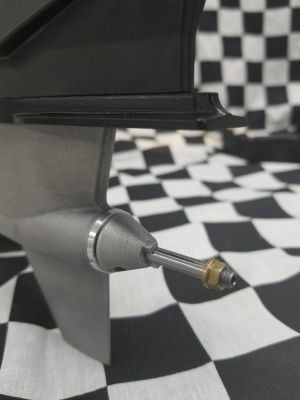 Gear oil to be installed prior to use (Click here for manual/instructions). Picture 1 Polished lower unit for display one. Lower unit is not polished, it comes in silver metal finish. 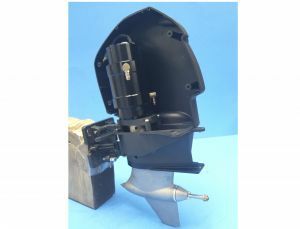 3/16" Prop Shaft and 5mm Motor Coupler, Outboard is black cowl and midsection with natural metal lower unit. Motor: No motor included. 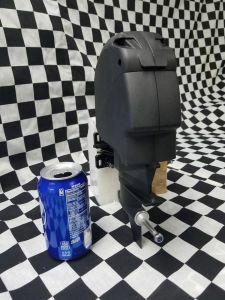 We suggest a 4092 sized motor in the kv of your requirements. Height: 11" (280mm), See picture 4, green board is in inches. 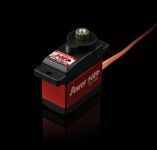 Motor Coupler Size: 5mm with 3/16" Prop Shaft or 8mm with 1/4" Prop Shaft. Material: Lower unit is Silumin (Lightweight, high-strength aluminum–silicon alloy) and the upper(black parts) plastic. Left or Right rotation prop can be used. 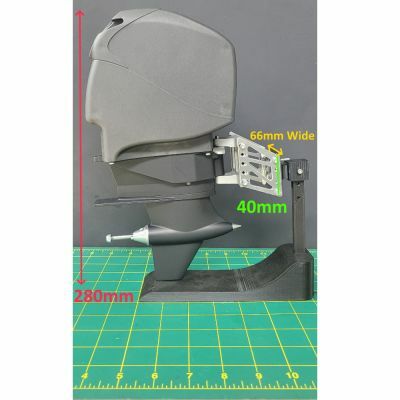 Requires: 40mm diameter motor and 25mm motor hole mounting spacing. 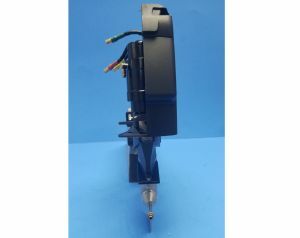 Can fit upto 92mm long motor. Linkage for steering, the following part numbers can be used, but there are other ways to do it, depending on the builder. 2x dh-497, 2x dh-4-40-3753, 2x ose-83106 and servo with double style servo horn. Notes: This is designed for scale boats in the 45" (1150mm) to 50" (1300mm) length range. 5-10 pounds total hull weight. Some pictures show motor with water jacket, there is no water pickup built into this drive. 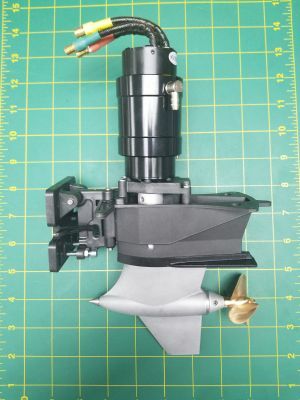 Propeller and 4092 motor are shown for display and size references only, no motor and no prop are included. These are well engineered units. Be sure to ADD LOWER UNIT LUBE before use! I feel some parts are very flimsy like the steering arm and tilt bracket. Otherwise I am glad I purchased them and still waiting to put them on a hull of suitable size.